Happy Birthday Lucy: Lucille Ball turns 100 years old! August 6th, 2011, will be comedienne Lucille Ball’s 100th birthday and we had to celebrate this auspicious anniversary. For decades, when ever the term “comedienne” comes up, the first image that comes to mind is Lucy. Born Lucille Desiree Ball to Henry and Desiree “Dee Dee” Ball in Jamestown, NY, Lucille learned about tragedy at an early age. Henry was a telephone lineman for Anaconda Copper, and when Lucille was three the family was moved to Anaconda, MT, and then to Wyandotte, MI. In 1915 Henry came down with scarlet fever and died. Dee Dee eventually remarried to Edward Peterson, who was less than enthusiastic about young children. As a result Lucille’s younger brother was sent to live with Dee Dee’s parents, and Lucy for a time stayed with Ed’s parents. The elder Peterson’s were a stern Swedish couple who took a low view of any type of frivolity. Lucy would later recall that all of the mirrors were removed from the house, except the one over the bathroom sink, and she was punished if she spent too much time admiring herself. The one shiny spot for Lucille in Ed and Dee Dee’s marriage was Ed’s membership in the Shriners. The Lodge needed female entertainers for an upcoming show, and ed encouraged his step-daughter to audition. Lucille, who had been desperate for attention and approval, realized it could be found on stage. At the Age of 15 Lucy convinced her mother to allow her to attend Drama School in New York. She was found to be a “tongue-tied teenager” who nearly disappeared in the shadow of her class-mate, Bette Davis. Eventually the school wrote to Dee Dee that “Lucy’s wasting her time and ours.” Determined to prove her teachers wrong, Lucy stayed on in New York, and by 1927, using the stage name “Diane Belmont”, she found some success as a model, first for fashion designer Hattie Carnegie, and later with Chesterfield Cigarettes. By the early 1930’s she had dyed her chestnut hair blond and moved to Hollywood. In Tinsel-Town she picked up a reputation as “Queen of the B’s” for her many roles in less than serious movies. She did appear in a couple of Fred Astaire–Ginger Rogers film, and was eventually cast with Rogers, who was a distant cousin, in 1937’s Stage Door, along with Katherine Hepburn. 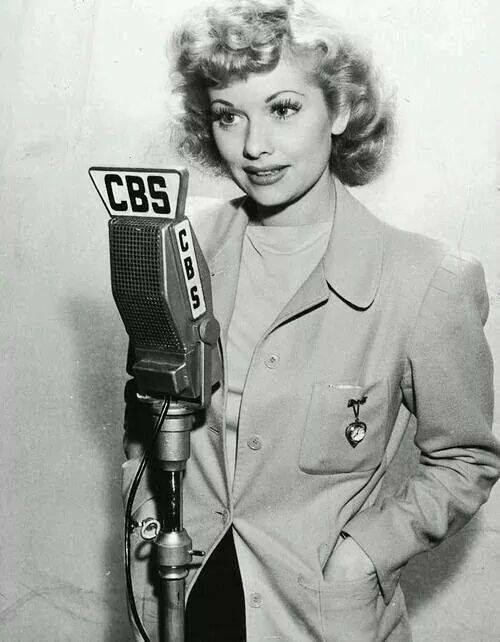 Like amny starlets, Lucy did some radio work to help make ends meet. In 1937 she was a regular on The Phil Baker Show, and during the 1938 season she appeared many times on The Wonder Show, starring Jack Haley. It was on The Wonder Show that she struck up a life long friendship with the programs announcer, Gale Gordon. Lucille appeared in a couple of less than memorable films in 1940, including Dance, Girl, Dance and Too Many Girls. What made the films memorable for Lucy were the small parts in each for a Cuban Band leader, Desi Arnaz. The couple eloped in 1940. Desi was drafted in 1942, but classified for limited service because of a knee injury. That meant he spent most of the war in LA, organizing and performing USO Shows. Lucy was a favorite guest on AFRS’s Mail Call, Command Performance, and GI Journal. In 1948 Lucy began work on the radio series My Favorite Husband, costarring Richard Denning. Early in the run the stories were about a prominent banker and his socially prominent wife, but as the series evolved they evolved into a middle-class couple who would appeal to a more diverse audience. Lucille Ball is honored with a Star on the Hollywood Walk of Fame at 6436 Hollywood Blvd for her work in Motion Pictures, and another for her Television Work at 6100 Hollywood Blvd. This entry was posted in Comedy, Gale Gordon, Old Time Radio and tagged Lucille Ball. Bookmark the permalink.